Vinyl film is a reversible method of changing the appearance of a car, unlike airbrushing. The film can always be removed and the "stock" look can be achieved, which is very helpful when selling –because styling is not just a plus for many buyers, but also may be an argument against buying a car. Application of the film takes less than a week and is less expensive than applying paint and varnish. If you want to paste over only some of the details - such as the hood, roof and trunk – the process takes only a few days. Hiding chips and strips under the film is also cheaper than repainting the part, moreover, there is no risk of not matching the color. Your car can be one of a kind thanks to very different and unusual types of film: carbon, camouflage, polished metal, chameleon and more. It should be noted that vinyl stickers is a product in demand not only from car drivers. Stickers for the walls, rear cover of phones and tablets, decorative stickers for windows and furniture are made for advertising purposes or interior decoration. Laptop vinyl film wrapping will be a practical and visually interesting step. Many modern laptops looking great in the store window thanks to radiant glossy cover collect scratches in daily life and fingerprints which have to be rubbed away several times a day. Vinyl is extremely good at solving these troubles: it prevents scratches and collection of fingerprint data, hides the defects that have already appeared and prevents your colleagues, looking at a laptop from the other side, from getting bored. Also, a sticker on the laptop can hide the manufacturer logo in cases where branding is undesirable –for example, during filming and photography. On the Internet, you can download or order stickers for every taste, highlighting your individuality. Moreover, given the availability of laptop vinyl stickers and its simplicity, they can be changed at least every week, depending on your mood. 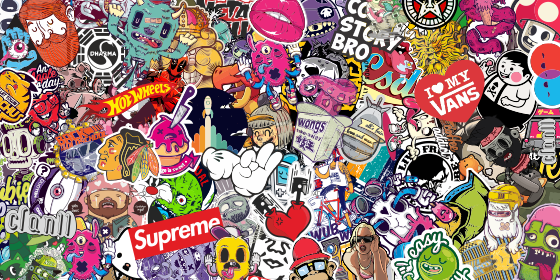 Here you can download the free layouts for sticker bombing.